Rowland Langmaid (1897-1956). Etching signed and annotated HMAS AUSTRALIA; not dated. Standard size: 11.25 x 6 ins (28.5 x 15 cms) approx. One of 7 ships of the Kent Class - a sub divison of the Royal Navy’s County Class which numbered 13 ships overall - HMAS AUSTRALIA and her sister HMAS CANBERRA were built for the Royal Australian Navy by John Brown on the Clyde in Scotland, were launched in 1925 and commissioned in 1928. The Counties’ design was constrained severely by the Washington Naval Treaty of 1922 which limited their displacement to 10,000 tons and their gun calibre to 8 inches (190 mm). They turned out handsome ships with high freeboard and three tall funnels: with a length of 630 feet and mounting a main armament of eight x 8 inch guns they developed 80,000 shp which gave a maximum speed of some 31 knots. 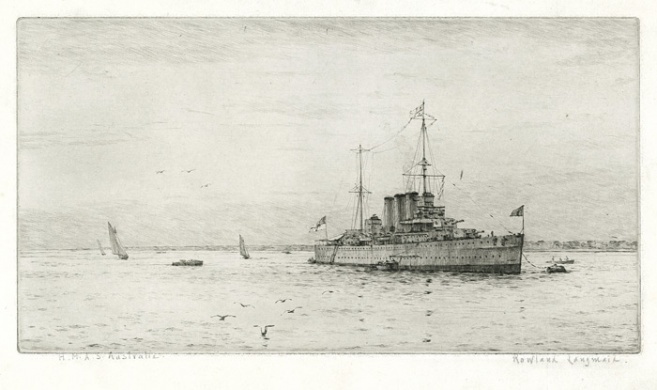 To many observers they represented an excellent compromise between the requirements for a heavy gun armament carried on a hull that was well enough armoured to enable the ships to put up a good fight in battle; and a ship that was well suited for independent patrolling over long periods the sea lines of communication around the world that was the Royal Navy’s task in the times. Good habitability and long range were important components of this latter task and HMAS AUSTRALIA scored well in this respect though there were detractors who wished the Counties had more side armour to protect their high freeboard. But as AUSTRALIA was so vividly to show in the years that lay ahead, the class did prove to be tough opponents in battle and their size gave them an ample margin of stability which allowed for many improvements and additions to be added during the testing years of the war. HMAS AUSTRALIA, shining as a new pin and manned by a proud and enthusiastic ship’s company from her native country, first commissioned on 28 April 1928, HMAS CANBERRA following her some 2 months later. AUSTRALIA duly left Portsmouth, England for Australia on 3 August 1928 and after stops at Montreal, Quebec, Halifax, Boston, New York, Annapolis, Kingston, Balboa, Tahiti, Wellington and Brisbane, duly arrived to a large welcome in her home port of Sydney on 23 October. Some 10 years later she went to war and what a war she had! Space here is limited but suffice it to say that hers was a record of hard work and frequent actions, some of which were to prove too close to call, such as an attack by Kamikazies in Leyte Gulf on Trafalgar Day, 21st October, 1944 when some 80 of her ship’s company were killed or wounded, her captain subsequently dying of his injuries. Patched up and back on the front line again off the Phillipines “The Aussie” (as she was widely known) was attacked again by Kamikazies on several occasions in early January 1945: over 100 were killed or wounded and the ship was heavily damaged too, losing most of her forrard funnel in one attack. She was finally withdrawn from the front line and by the time she had been repaired in Plymouth, England, the war was over. Returned for further service in the Royal Australian Navy she finally decommissioned on 31 August 1954.